Don't forget that a single plant in a wonderful pot can look stunning. Also, try grouping your containers and try using some ​pumpkins or decorative gourds to unify your design. This picture was taken after several hard frosts and some snow that melted after a few days. Even after the cold and snow, these plants look great. 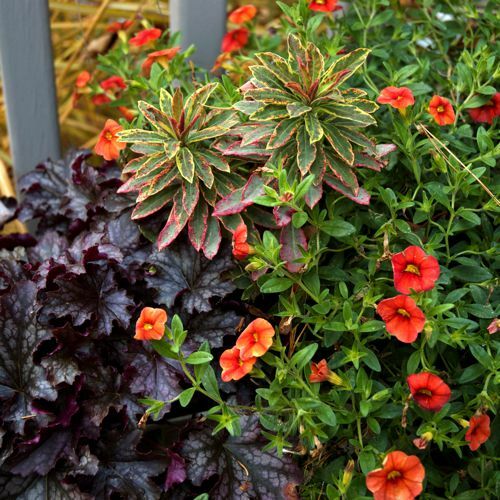 The heuchera, Dolce 'Blackcurrant, euphorbia, 'Helena's Blush,' and calibrachoa, Superbells 'Dreamsicle,' make a combination that is hardy and colorful and will last through fall and into winter. These relaxed fall planters boast a mix of textures and a bright pop of color. The lower planter contains calibrachoa hybrid, Superbells 'Dreamsicle,' and 'ponytails' grass (Stipa tenuissima), also called Mexican Feather Grass. This planter by Estabrooks Farms, in Yarmouth, Maine caught our eye because the snapdragons looked just like candy corn, a favorite Halloween treat. The how the purple 'Bluebird' nemesia, contrasts beautifully with the 'brown and orange bicolor' snapdragon. While the 'crown red' snapdragon adds some pop, the leather leaf sedge pulls it all together. This grouping of rustic fall container gardens features planters made from hollowed out birch logs. Plants include coleus, fuchsia, impatiens, and purple shamrock. By grouping container gardens you can really change the look of an area, be it a deck, a yard, a terrace, a landing or stoop. You can also move your containers around in the grouping to change the look. This is particularly handy in fall because plants like asters and mums get tired and when they do you can easily move them to an out of the way spot. This huge fall container garden is one of the most imaginative and beautiful we have ever seen. The use of bittersweet, branches, moss, and ivy with the giant gourd and flowering kale is really a knockout. Bravo to VSF, of New York City. This basket of flowering cabbage will look even better as the weather gets colder and the colors deepen. Because of its low profile, this container garden would look great as a table centerpiece or on a low step. This fall container garden will last well past the first frost. This fall container garden uses purple fountain grass ('Rubrum," Pennisetum setaceum) and creeping wirevine (muehlenbeckia) in a simple arrangement. The plain metal planter works well with the elaborate textures of the grasses and wirevine, giving the container garden a modern look. Large-leafed lamb's ear is a great fall container plant. It can be beautiful in a mixed container or alone in a pot. This pot, by TerraCycle, is made from recycled e-waste like old computers. This fall container garden uses the wonderful structure of rosemary to complement the loosey-goosey look of the fountain grass. The combination of the dusty pink and sage of the Sedum, also known as stonecrop, looks great draping over the edge. This container garden will look fantastic through fall and into winter. This container garden in a rustic basket is made for the shade. The fuchsia ('Summer Splash') and purple shamrock ('Charmed Wine,' oxalis) work well together and are happy in shade to part shade. Neither is fussy and when the temperatures start to dip you can bring them inside to overwinter. This basket of hens and chicks (sempervivum,'Red Beauty') will last right through the fall. These succulents thrive on neglect and you can transplant them before the ground freezes. They are incredibly easy transplant - you basically just rest them on some sandy, well-drained soil. If it's sunny they should spread and thrive. White clover, "Dark Dancer," is a wonderful fall container garden plant. The colors are fantastic and it's hardy to -30°F! The leaves are small and the plant is compact and dense so it can really tie a container garden together. The pink of the aster really brings out the deep purply-pink of the white clover. This large terra cotta pot is stuffed to the brim with fall plants: large leafed lamb's ear, sweet potato vine, sedum, flowering kale, and a small ornamental grass. This fall container garden has a great look. The dark coral bells (Heuchera hybrid, 'Dolce Mocha Mint'), with the rich looking and textured ornamental grass ('Toffee Twist' carex flagelifera) and some mums for color, make this container garden a classic for fall. This birch bark covered nursery container takes about 10 minutes to make if you have access to the bark. All you have to do is cut the bark to fit a large nursery container and attach it to the pot with twine. For a finished edge, just tuck the bark under the rim of the nursery pot. Using a plant that drapes over the side, in this case, wirevine also pulls the look of the pot together. We love the playful look of hot peppers and they thrive in container gardens. Wait until they turn red and then cut them and hang them up to dry. Keep some for decoration and grind up the others to use for cooking. Heucheras come in totally fabulous colors and are very hard to kill. They look great alone but also play well with many other plants. Most heucheras scoff at sub-zero temperatures, and some are so good-natured that they are equally happy in full sun or full shade and anything in between. Coming in a huge variety of colors and leaf textures, heucheras look great in almost any pot. This garden planter is made from a birch log that was found naturally hollowed out in the woods. Filled with potting soil, and a Dolce 'Key Lime' heuchera, it makes the perfect fall decoration.